Back in the last century, when I first logged on to the internet, I received some advice from a friend about online behaviour: “Never write anything in an email or post to a forum that you wouldn’t be prepared to see on the front page of tomorrow’s Sydney Morning Herald with your name on it.” It’s advice that I follow to this day. The internet is not, and never has been, anyone’s private domain. 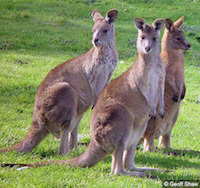 Over the last week I have been involved in an ongoing debate with members of the ACT Greens about their support for the annual cull of kangaroos in the Territory. If there’s one thing the ACT Greens want to shoot faster than kangaroos, it’s critics. I stress, at this point, that this refers only to the Greens in the ACT, not the other state and territory parties that comprise the Australian Greens. No, the ACT Greens are the weak link in a party that has generally stood on ethics rather than politics and has never turned away from their commitment to environmental justice. A member of the ACT Greens, a candidate for the forthcoming ACT Legislative Assembly election, posted a photo on Facebook of a group of them at a fund-raiser for endangered bettongs. Lucky bettongs. They score a fundraiser in Canberra on the same night that professional, government and Greens-hired shooters are out slaughtering kangaroos not kilometres away. I responded to the Facebook post (apparently I’m a ‘friend’ of this candidate - perhaps not anymore) that it was a pity the Greens’ concern for wildlife didn’t extend to kangaroos and there followed a lengthy discussion in which they claimed to have “read the science”, and understand the issue because they “studied ecology at university”. Yeah, right. I studied art at university but it doesn't make me Picasso. Their carefully contrived narrative runs along the lines of, “Oh, we all love kangaroos and it’s unfortunate they have to be killed.” The justification for this is that the kangaroos allegedly destroy habitat for earless dragons and legless lizards, both endangered in the ACT. “We’re not just a party for cute and furry animals, you know,” said one member. Bettongs, anyone? 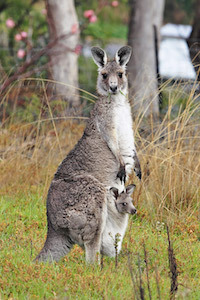 • The ACT government has a direct economic interest in the cull as, a few years after kangaroos are exterminated from certain tracts of government-owned land, that same land is sold to developers and very quickly becomes a giant construction site. I’ve seen no scientific findings of the effect of giant construction sites on the habitat of legless lizards and earless dragons. Perhaps the Greens could look into it when they’re not gazing up their own fundamental orifices. However, returning to my original point about the internet. After several days of being patronised, lectured and dismissed by several of these Greens members, I suggested that seeing as this discussion was being held over a public medium, that they wouldn’t mind being quoted. Suddenly this was a ‘private’ discussion and my original comment was effectively crashing their own private little party. They can post their happy snaps of bettong fundraisers but once the discussion turns to matters less popular for them, they want to duck for cover behind the safety of ‘privacy’. Oh, no. we won’t be quoted. You’re harassing us and this is private. I can stand by every word I say on this matter. The ACT Greens, apparently, can’t. The ACT Greens Pty Ltd are what happens when a good party becomes corrupted by dirty politics. They have become a mouthpiece for a cynical Labor government that knows it can buy their support. Oh, sure. Labor has given them a few wins – light rail, free range eggs – in order to buy their support for an unnecessary wildlife rout for the benefit of economy and growth. Supporting economy and growth is fine, unless you’re hiding behind the guise of being a party for environmental justice.